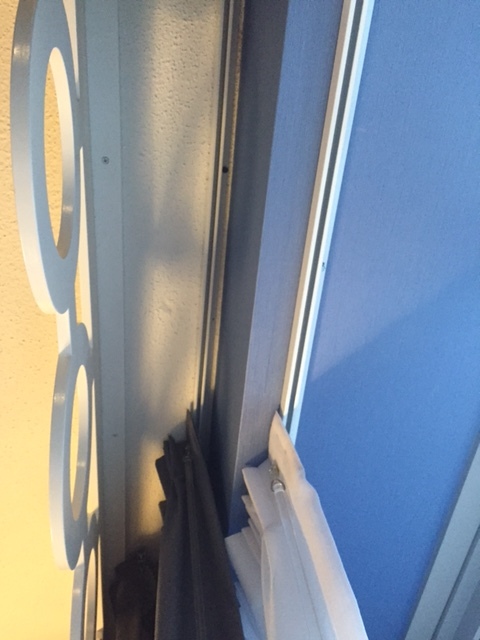 One of our staff recently stayed in a hotel in the middle of a busy, metropolitan city, and she couldn’t help but notice the type of track and drapery hardware the hotel used. She was happy that wands were in place to make opening and closing the curtains easier. She also noted with pleasure the two parallel ceiling-mounted tracks that allowed the hotel room designers to hang a sheer curtain and heavy drape that could be opened and closed independently. But the most striking thing she noticed was what she didn’t notice. Right outside her window was a bustling city with traffic, car alarms, police sirens, etc., and yet she slept peacefully undisturbed in a dark, quiet room. Hotels have long known the secret to a good night’s rest lies in hanging a curtain panel like our Eclipse light-blocking curtains. Most decorative curtains that you can buy in your local home décor shop do not significantly block light and sound, no matter how thick they are. This is why it is hard for most residential clients to recreate the hotel experience. We carry everything you need to hang curtains in your bedroom just like those found in hotels: ceiling mount curtain tracks, carriers, wands, and sound-reducing, light-blocking curtains. Pull these curtains shut, set the room at 67 degrees Fahrenheit, and prepare to sleep like a hibernating bear. With our Eclipse curtains you don’t have to sacrifice style while creating a dark, cool, quiet place to sleep. The curtain panels are available in 23 colors, and can be custom-made to your needs. They are nice enough that you can hang them alone or with a sheer, but if you have a patterned curtain that you are attached to, use the Eclipse panel as the inside curtain that can be used at night to darken and quiet the room, yet opened and tucked behind the decorative curtain during the day. We’ve got lots of ideas about how to use Eclipse curtain panels. Check out our Pinterest page to see more.